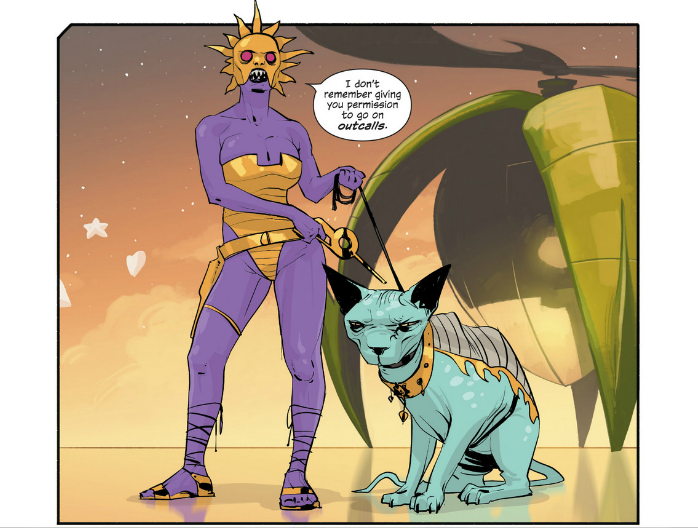 Saga Issues 4-6 by Brian K. Vaughan and Fiona Staples…For Reals This Time! That’s The Will. He’s a bounty hunter, or in the slang of this universe, a “Freelancer.” So far we’ve seen him defeat giant monsters, and argue over the phone with his spider-lady ex, The Stalk. He turned down an opportunity to hunt our heroes and their baby because he wouldn’t get an exclusive contract. The Will gets results, chief! Except when you threaten Lying Cat. Then The Will’s results are lessened. Lying Cat is the breakout character of this series. At least on the internet. Cause Internet = Cat Love. And this is a giant cat that can tell when people are lying. It is a giant cat that can tell when people are lying, and it SAYS, “Lyyyyinggg.” I don’t actually recall if they draw it out like that, but that is how a talking cat would sound. They would not have the cool Bill Murray-ish voice of Lorenzo Music. 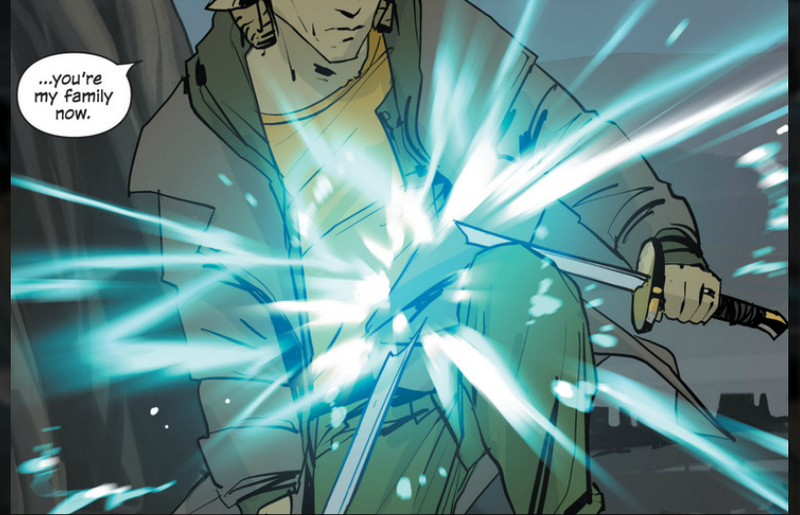 …and then THIS to a sword! Take that sword! And then they all take off in a spaceship! Anyway, I don’t really want to go into plot details. That doesn’t get you to read this comic. But like I said, Vaughan and Staples are still creating. They haven’t just set us off on an adventure with a couple of stock characters, they’re continuing to reveal more about Alana and Marco, while also exploring characters like The Will, Prince Robot IV, Isabel, and even giving a little depth to the planet full of hookers. Not the actual planet mind you, but to the hookers living on it. 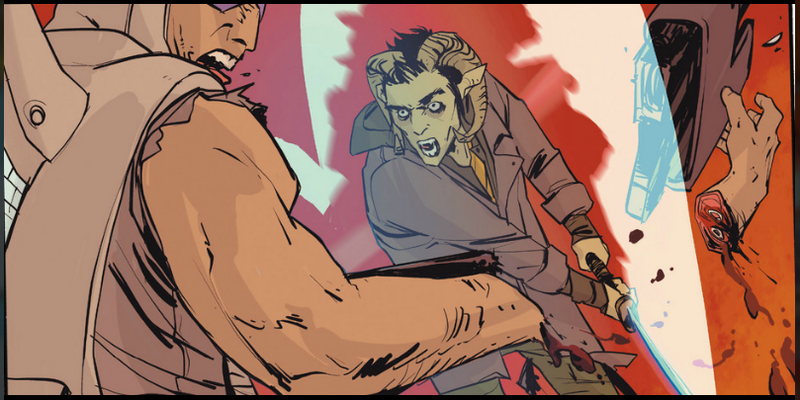 What I’m getting at, is that there’s no throwaways in Saga. Nothing is done for the sake of being “cool,” or selling an action figure, though I’d definitely buy up all these action figures. 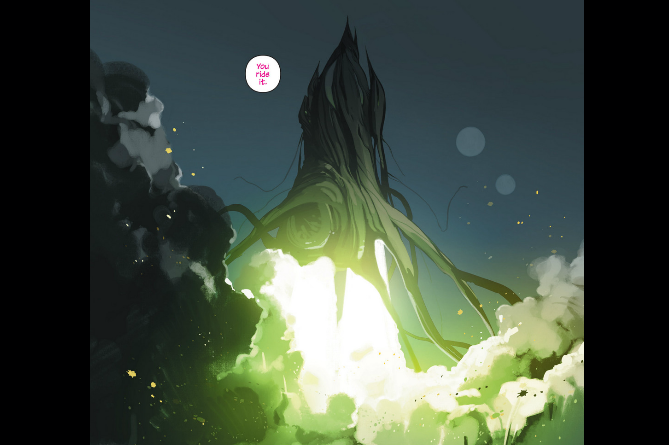 This series is looking like it could very well live up to the definition of it’s title, Saga, which means “epic work of fiction.” I’m in it for the long run, and hope you’ll continue to read it along with me. Feel free to consider the comments section a spoiler and story discussion area…let’s talk about this comic! Pingback: Stuff I Bought, Week of 9/15/12 (SUPER VALUE EDITION!) « Read This Comic!